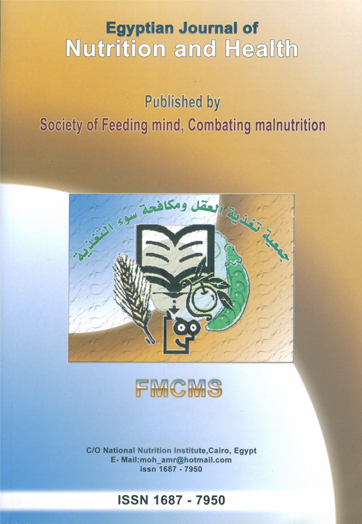 The study was done to assess the nutritional knowledge and nutrients intake among lactating women. The total sample size was 151 lactating women selected randomly from those attending the Breastfeeding clinic at the center for social and preventive medicine (CSPM). The results revealed that obesity was the dominant feature in 47.7% of cases, while overweight and normal weight constituted 26.5% and 25.8% respectively. The majority of the women had very good nutrition knowledge (77.5%), while 22.5% had a good knowledge. 76.2% women were at risk of hunger and 23.8 were food secure. Poor maternal dietary quality may have implications for both mother and child, and socioeconomic position and nutritional knowledge are likely to be important. Effective interventions to support mothers to achieve healthy diets for themselves and their families are needed. Lactation period is an opportunity to increase awareness of the mother toward healthy nutritional practices. Achievement and maintenance of good dietary habits is expected to duplicate the benefit of health outcomes when mothers become models for their children and their families. Nutrition education for mothers should be provided in the all health and PHC centers that deal with breastfeeding mothers. It also important to increase awareness of lactating mother's and educate them about the quality of diet through mass media.